I Broke My Leg Riding in My Friend's Car. Who Will Pay My Bills? Home » The Law & You » I Broke My Leg Riding in My Friend’s Car. Who Will Pay My Bills? I Broke My Leg Riding in My Friend’s Car. Who Will Pay My Bills? A viewer was injured in her friend’s car after the driver swerved to miss a deer. Who will pay her medical bills? Car accident attorneys Greg Fellerman and Ed Ciarimboli explain what happens next. 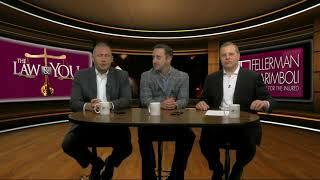 Dave Kuharchik: It is time once again for “The Law & You” and we’re back tonight from the new virtual law center with attorneys Greg Fellerman and Ed Ciarimboli. I’ll tell you what, a lot of good stuff on the set. But the mugs. Ed Ciarimboli: We got new coffee mugs coming. New coffee mugs next week. Dave: I guess we get to keep the old ones. Ed: Fancy new set. We’re moving up in the world. Dave: Lot of great things going on. We want to talk about a situation hopefully it will get a little better for Melanie in Jessup. She says, “I was riding in my friend’s car when she swerved to miss a deer, crashing into a telephone pole. I broke my leg.” Who is going to pay the bills for Melanie, that’s what she would like to know. Ed: Melanie, in order to answer this question, we would need to ask you one more question. And that question would be, do you have your own automobile insurance? If you have your own automobile insurance then the first $5,000 or whatever you have on your policy under the medical provision, that’s going to go to your automobile insurance. And the reason being is, for medical only, Pennsylvania is a no-fault state. So it doesn’t matter who caused it, your medical provision is going to go under your own policy. If you don’t have your own policy, I’m going to let Greg tell you what’s going to happen. Greg Fellerman: It’s pretty simple. If you’re a passenger in the car and that car is insured, you will be covered under that policy by the driver’s insurance. So what it does is protects people who don’t have insurance who are in the vehicle. So, it really makes a lot of sense. But the good news is you have coverage from one way or another. Ed: You are a handsome devil on this new virtual set. Dave: You know, I think the advice has gotten up the next level too. It’s great all around. Ed: I feel smarter already. Dave: Guys feel like they’re part of the network here. We treat them well, the new virtual law center. And don’t forget, results matter with attorneys Greg Fellerman and Ed Ciarimboli. Guys, thanks for being here. We’ll see you back here tomorrow.